Vanee Roasted Turkey Gravy is made with real oven-roasted turkey and pan drippings for a great homemade flavor and appearance. Perfect over turkey, mashed potatoes, stuffing, or pasta. 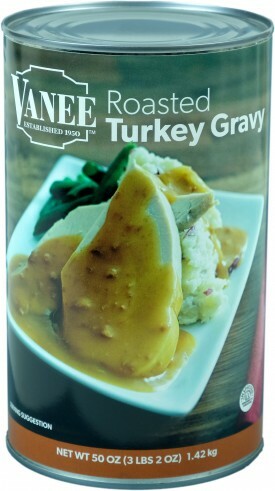 Vanee Roasted Turkey Gravy has no added MSG, no high fructose corn syrup, is shelf-stable for easy storage, doesn’t require boiling water, has unparalleled batch-to-batch consistency, and uses real roasted turkey meat. Each 50 oz. can has 23 quarter cup servings, for a total of 276 servings per case. 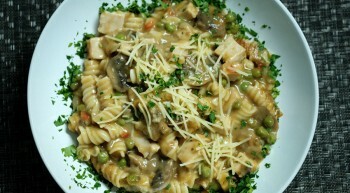 Great over turkey, mashed potatoes, stuffing, or pasta. Water, Roasted Dark Turkey Meat, Food Starch - Modified, Enriched Wheat Flour (Wheat Flour, Niacin, Reduced Iron, Thiamine Mononitrate, Riboflavin, and Folic Acid), Contains less than 2% of Ascorbic Acid, Calcium Lactate, Caramel Color, Chicken Broth, Chicken Fat, Corn Starch, Dehydrated Turkey, Disodium Guanylate, Disodium Inosinate, Dried Turkey Meat Powder, Flavoring (Contains Canola Oil), Garlic Powder, Lactic Acid, Lipolyzed Butter Oil, Maltodextrin, Nonfat Dry Milk, Oleoresin Paprika, Onion Powder, Salt, Soy Flour, Soy Sauce Solids (Soybeans, Wheat, Salt), Sugar, Torula Yeast, Turkey Fat (contains Tocopherols), Turmeric, Yeast, Yeast Extract.